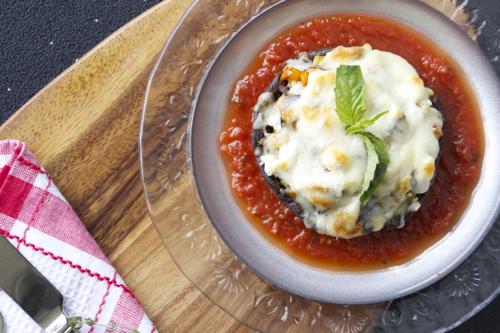 A plain portobello pizza is boring, but a Ratatouille Portobello Pizza, now you’re talking! So easy to make, everyone will be calling you Chef! A couple of weeks ago, my husband decided to go vegetarian for a week, I’m sure you saw it on my Instagram if you follow it. I have never been a vegetarian or vegan so this was sort of a challenge for me. It wasn’t about what vegetarians eat, it was more like how do vegetarians eat!? I’m a chef and you would think that this shouldn’t be such a big deal but let me tell you, it was! I thought about all the types of foods there are; pasta, stew, casserole, stir fry, you name it, I wrote it down. But one that was on my top list was pizza! Only problem was, he doesn’t want any carbs! 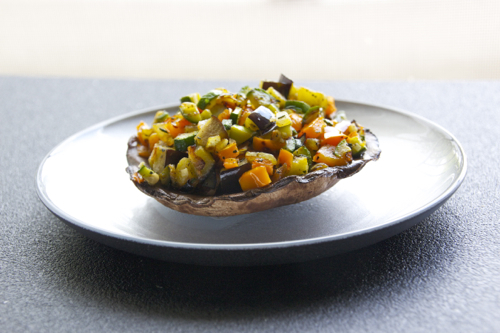 So what better pizza to make than Portobello Pizza!! 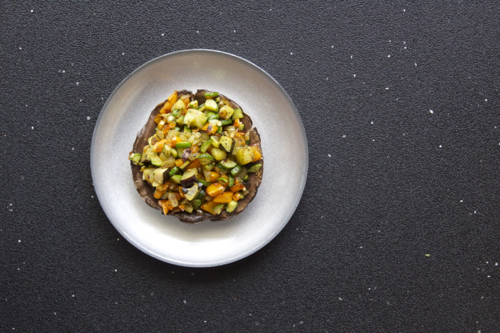 But just stuffing it with tomato sauce and cheese is boring so I decided to stuff it with my favorite vegetable dish, Ratatouille! The outcome was amazing! Layers of flavors bursting combined with the saltiness from the cheese, it was the perfect vegetarian dish! We didn’t even crave any meat after eating it! 3. Heat 1 tbsp of olive oil in a sauté pan over medium high heat. 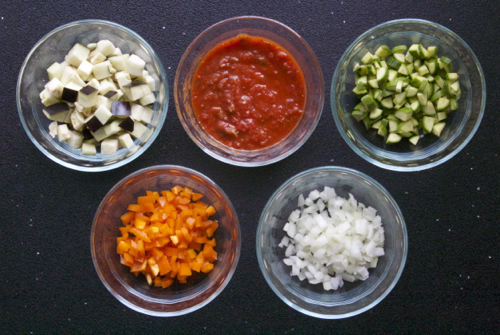 Add the onions and bell peppers and sauté for 1 minute. 4. Throw in the zucchini and sauté an additional minute. 5. Lastly, add in the eggplant, thyme, garlic clove and cook for one more minute. 7. 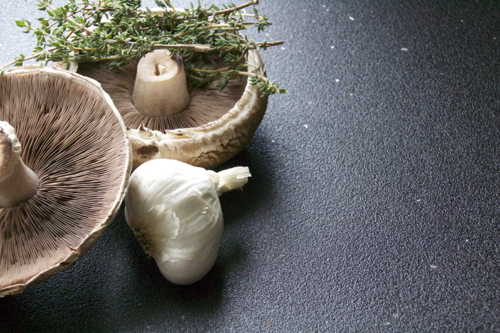 Remove mushrooms from the oven; turn them over so they are facing up. 8. Evenly divide the mixture on top of each mushroom cap. 9. Crumble as much goat cheese you prefer on top of the vegetables then sprinkle 1/4 cup of mozzarella on each pizza to cover. 10. Bake for 12-15 minutes on the same foil-lined sheet tray you used earlier until golden. 11. 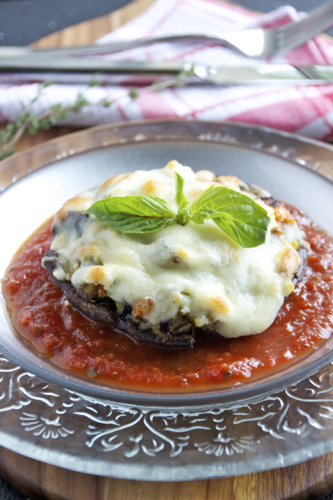 Heat 1/2 cup of marinara sauce in a saucepan or in the microwave, place 1/4 cup onto each dish, top with the Portobello pizza. 12. Garnish with some basil leaves. *Take a spoon and go along the ribs of the mushroom to remove them.